"2017 S.S. Meteor Project Photos"
The S.S. Meteor Preservation and Stabilization Project is coming up fast. The date is April 28 & 29, 2018. 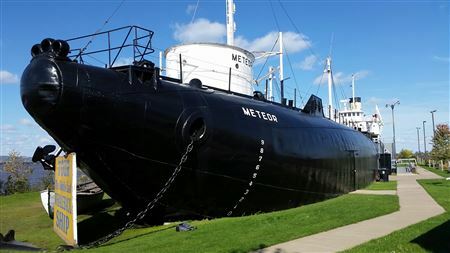 Ask them about the special pricing by mentioning the "Whaleback Cleanup"
The S.S. Meteor Project was another success. The weather was good and the local refinery that started on fire was contained and the area didn't need to be evacuated. This would have canceled the project for that weekend. Luckily things went our way! One of the largest tasks to complete was on the outside work and painting which started Saturday, since Friday was a cooler and rainier day. A larger crew started preparation for painting the expansion deck from the Pilot house structure to the bow turret. This was a very large task to complete and it was completed by the end of Sunday afternoon. If it wasn't for the persistence of the crew painting it, it would have not been completed. Thank to all that were on that team! The second large task to complete was the preparation and painting of the upper engine room. This task was also quite a project to overcome. It was two years in the making of a platform to safely complete the task. The platform was built in 2017 and use in 2018 to paint the upper engine room. The platform will be removed in 2019 after the final coat of paint is applied. The platform will be stored in the boat in a storage area until the upper engine room will need painting again. The third largest project was welding. The forward turret / chain locker need the roof welded shut. the upper edge of the roof where it is attached to the turret separated over the years and was allowing a great amount of water in it. It was completed by our one and only welder Craig David and his son Gunner, which is now worked his way up to be a career welder. Thank to you guys that welded the turret and the many other areas that needed welding. Including the port side lower corner of the crew quarters. If you have any questions or comments about the S.S. Meteor Preservation Project (s), please contact the Project Chairman Phil Kerber. My information is above and below. Thank you again and hope to see both former and new faces on the next project.